Ian Fleming colours Live and Let Die with James Bond’s clothes better than in any of his other stories, with mentions of both Bond’s own clothes as well as his important disguise. 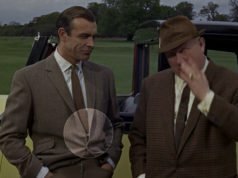 Later in Chapter 1 is mentioned of Bond and Dexter, “They left their hats and coats on a chair”, though we have no description of Bond’s hat or coat. In Chapter 3 Bond is forced to Americanize his appearance for undercover work. Even though he has to wear some tasteless American clothing he can still wear the dark blue suits he likes so much. “The afternoon before he had had to submit to a certain degree of Americanization at the hands of the FBI. A tailor had come and measured him for two single-breasted suits in dark blue light-weight worsted (Bond had firmly refused anything more dashing) and a haberdasher had brought chilly white nylon shirts with long points to the collars. He had had to accept half a dozen unusually patterned foulard ties, dark socks with fancy clocks, two or three ‘display kerchiefs’ for his breast pocket, nylon vests and pants (called T-shirts and shorts), a comfortable light-weight camel-hair overcoat with over-buttressed shoulders, a plain grey snap-brim Fedora with a thin black ribbon and two pairs of hand-stitched and very comfortable black Moccasin ‘casuals’. “He also acquired a ‘Swank’ tie-clip in the shape of a whip, an alligator-skin billfold from Mark Cross, a plain Zippo lighter, a plastic ‘Travel-Pak’ containing razor, hairbrush and toothbrush, a pair of horn-rimmed glasses with plain lenses, various other oddments and, finally, a light-weight Hartmann ‘Skymate’ suitcase to contain all these things…. 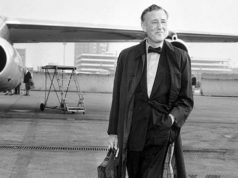 “Bond looked grimly at the pile of parcels which contained his new identity, stripped off his pyjamas for the last time (‘We mostly sleep in the raw in America, Mr. Bond’) and gave himself a sizzling cold shower…. At the end of Chapter 4 the coat is mentioned yet again: “It was raining. Bond turned up the collar of his coat and gazed up the Avenue to his right, towards Central Park”. By Chapter 12 he is still wearing his American disguise, as he is spotted as Solitaire’s companion: “‘Wid a man ‘n a blue suit, grey Stetson. '” In this context, a “Stetson” could either mean that Bond’s Ameican hat is from the Stetson brand, or it could have been used as a proprietary eponym for a fedora. Thanks for posting these, please do more from the novels, which I've read mulitple times and enjoyed emensley. Yet another enjoyable post on a great blog. Well done, and keep it up. yes, what was Fleming's fascination with nylon underwear. I recall that he mentions it in another novel as well, sounds really horrible!!! Fleming also wrote that Bond wore "nylon underclothes" in Diamonds Are Forever. I can't imagine being comfortable in that either. One thing that I noticed on recently rereading this book, is that it contains the only instance that I recall of Bond wearing any other kind of tie than a black knitted silk one (other than black-tie occasions). 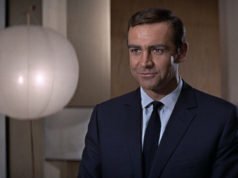 While Bond is never described as wearing the Foulard ties mentioned above, he did wear “a garishly striped tie and allowed a broad wedge of handkerchief to protrude from his breast pocket” on his trip to Harlem with Felix Leiter.